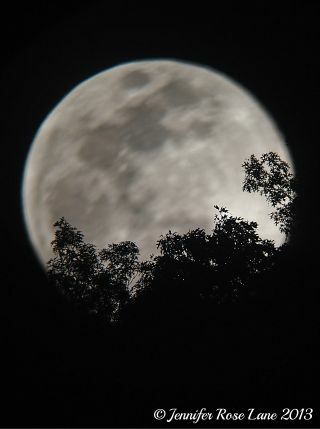 Astrophotographer Jennifer Rose Lane took this image of the Supermoon from West Virginia on June 23, 2013. Homer Hickam is the New York Times No. 1 best-selling author of "Rocket Boys" — also known as "October Sky" (Dell Publishing, 2000) following the book's adaptation to film — "Crater" (Thomas Nelson, 2012) and "Crescent" (Thomas Nelson, 2013) and a retired NASA engineer. He contributed this article to SPACE.com's Expert Voices: Op-Ed & Insights. Armstrong City is a bustling little frontier town on the moon as imagined in my novel "Crater." Nearby is the Apollo 11 landing site which has been turned into a tourist attraction, complete with "photos of the American astronauts Armstrong, Collins, and Aldrin for sale along with other souvenirs, including models of the Apollo capsule and the Eagle lander." In the novel, a tour guide points at the truncated base of the Eagle and an American flag hanging on a pole and tells slightly bored tourists that the original flag was knocked down when the top half of the lander took off. The guide also notes the tracks winding through the site, the result of a Chinese robotic vehicle barging across it on the 60th anniversary of the Eagle's landing. With lights, signs and memorials dotting the cratered plain around and within the landing site, it is almost impossible to imagine what it had once looked like in 1969. In "Crescent," the sequel to "Crater," I have responsible members of the lunar exploration community forming an Apollo Restoration Committee to assess the landing sites, evaluate their condition and determine what it would take to restore them, as near as possible, to their original state. When the committee visits, they find nearly all of the sites have been compromised with boot prints from poachers who removed pieces of the landers and moon buggies for souvenirs, or to sell them on eBay. Recently, with real life more or less copying my art, members of the House of Representatives proposed the Apollo Lunar Landing Legacy Act, whereby all the landing sites would be designated as part of the United States National Park System and essentially put off-limits to exploitation by other countries or commercial entities. Although the bill didn't go anywhere in the legislative process, I think these Congress folks were on to something good — although I would go a little further by actually claiming the landing sites as American territory purchased by the blood and treasure of these United States. One of the remaining legacies of the Cold War is the 1967 Outer Space Treaty, which mostly concerned itself with keeping nuclear weapons out of space, but also went on with a high-minded declaration that the moon and other "celestial bodies" would forever be considered the common heritage of mankind and not subject to national claims of sovereignty. In other words, none of the signing countries could plant a flag on the moon, Mars, an asteroid or any other object in the sky and claim it as theirs. Left open, mainly because it wasn't thought feasible, was whether commercial entities might make such claims. It is my assertion that the Outer Space Treaty should be considered as moribund as the Treaty of Tordesillas, signed in 1494, in which Pope Alexander VI essentially carved up the New World between Spain and Portugal. What I would really love to see is a rush to claim territories on the moon and everywhere else "up there" because there's really only one good way to do that: Actually go there and push your standard into the dust. As it is, the United States can't even put Americans into low-Earth orbit, a sorry state of affairs which might be changed if other countries were engaged in a heavenly land grab. Well, I can always hope. In both "Crater" and "Crescent," the moon is a raw frontier carved up between ruthless entrepreneurs reminiscent of Henry Ford and John D. Rockefeller. There are also groups of people, similar to the pilgrims and the Mormons, who have fled to a harsh land to escape religious persecution. Earther ex-pats are also there, having run to the moon to escape the 22nd-century versions of the IRS or angry spouses. In other words, it's a bit like a high-tech American Wild West with a lively population of quirky people who get things done. If real life goes on to truly imitate my art, I think we'd better lock up our Apollo treasures before our descendents turn those old landing sites into amusement parks or Helium-3 mines, erasing the high-water mark of American 20th-century civilization forever.